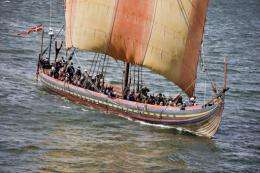 File illustration photo shows a replica Viking ship in Northern Jutland in August 2008. Researchers say Vikings used transparent calcite crystal to fix the bearing of the Sun, to within a single degree of accuracy. Ancient tales of Norse mariners using mysterious sunstones to navigate the ocean when clouds obscured the Sun and stars are more than just legend, according to a study published Wednesday. While experts have long argued that Vikings knew how to use blocks of light-fracturing crystal to locate the Sun through dense clouds, archeologists have never found hard proof, and doubts remained as to exactly what kind of material it might be. Even in the era of the compass, crews might have kept such stone on hand as a backup, the study speculates. 'and most likely as far as North America'. Well, their houses have been found in Canada, so yeah, it's 'likely' that they went there. "Over 1,000 years ago, before the invention of the compass, Vikings..."
Rubbish. The Chinese invented the compass a couple of thousand years before the Vikings even existed. The magnetic compass was first made in China during the Qin dynasty (221-206 B.C.). Why not to check the hard data on the web before posting? Irregardless this was a unique navigational technology developed by ancient mariners and as the author cited was actually complimentary to the magnetic compass. The researchers have illuminated an age old myth to uncover a completely new concept. Amazing. No, the first mention and evidence of a compass-like contraption for navigational use in China was contemporary with the Vikings. Magnetism itself and various uses for it were known well before then, not only in China but elsewhere as well (Greece, Mesoamerica...), but before ~1000AD the Chinese didn't use magnetic compasses, rather various simple but ingenious mechanical tools (like the south chariot). One thing worth mentioning is that navigating by celestial objects is more accurate than a standard magnetic compass in the North Atlantic (Polaris' bearing differs from true north by less than 1dg, for example). The researchers have illuminated an age old myth to uncover a completely new concept. IMO many old myth have deeper background, than we are willing to attribute them by now. It's particularly relevant to many of so-called miracles based on various psychic phenomena, visits of extraterrestrial civilizations in the role of gods, etc. The problem is, we are ignoring this research, because it cannot supply the reliable output. Which doesn't play well for methodology of mainstream science, which just needs to generate the positive results all the time. Today the scientists are dealing with the basic research like with industrial production, dependent on uninterrupted flow of scientific publications - no matter how their results are important or trivial. Such pressure ("publish or perish") not only constrains the quality and originality of scientific research, but it introduces a deep bias into preferences and choices of its subject. Unfortunately, much of the history of the Vikings (aside from the sagas) was written by the people they conquered and terrorized. We may,never know as,much about them as we've learned of other cultures. This is true. In most cases, some mysterious events and myths are not generally dealt with by scientists and other researchers, because it does not CONFORM to expectations and proven history, and is mostly dismissed as hearsay and innuendo. . . .or mass hysteria. Also, if the 5 senses cannot perceive or detect it, then its existence is regarded as impossible. ...and so your alternative is to take every myth at face value? Or what exactly do you propose. Believe in weather gods much, do you? And if not: why not? ..some mysterious events and myths are not generally dealt with by scientists and other researchers, because it does not CONFORM to expectations and proven history.. The question is, if they shouldn't be researched just because of it. As Ober said recently, if you're going to stick to what is known, then become a historian and don't waste place in research for people, who are willing to research these things. Werner von Braun: "Research is what I'm doing when I don't know what I'm doing. When I know about it, it's just collecting of stamps." The question is, if they shouldn't be researched just because of it. Some have. E.g. the floating out-of-body-and-looking-on-from-above experiences people report during operations have been subjected to tests (by placing really obvious LED signs on top of the operating room lights. None of the subjects describing an out-of-body exprience included seeing them in their description). As for any other phenomena: You're welcome to research them if you feel you have a valid test setup. The problem is that if you claim the thing cannot be measured by the 5 available senses - then how exactly do you propose to do research on it? And why do you even claim they are real if no one has sensed them? At the end of the last "Golden Age" most of the knowledge was hidden in several systems so that it would not be lost. Consider the Myth/tale of Osiris as the key. He was chopped into pieces and spread over the world by Seth, his brother and ruler of the underworld. Isis searched the world to find all the pieces and put him back together again. Truth/Osiris lived again. On our approach into the next Golden Age, the Age of Aquarius, Truth/knowledge is again being found and pieced together. Dec. 21, 2012 is the beginning: enjoy and behold the Light. They probably encountered the vast native American population and weren't able to fully colonize . Yes, it's nice to see that we didn't get off track and ignore the work of this international team of researchers. I see, a string theory problem... I can assure you, it can be researched quite easily, if you manage the BBS show. While the topic of the research and article came about from a basis in examining myth around possible physical artifacts (the Vikings' use of crystals), extending this to both ancient Egyptian religious mythology and modernistic quasi-religious "end-of-the-world-as-we-know-it" prediction based on astrology seems about as useful and on-topic as, say, Harold Camping's 3 failed predictions of arrival of "the rapture". Why not instead engage some critical thinking when you get out of bed each day? Assuming those were real settlements and not just some fortifications or temporary winter shelters that would mean that they needed to bring over their women, non-warrior types like craftsmen (smiths, shipwriths etc). Begins to sound like a big colonisation project rather than a coastal raid. Not to mention that North American Native villages were not exactly rich in plunder to attract raiders especially from that far away. what,who and when sort of pales into the background when you stop to think of the "research" that the Vikings must have been involved in.i'm sure that one day Knut did not just pick up a rock and said "check this out,lets put it in a boat and go". a lot of complex connections,trial and error and real life testing must have gone into this.very pragmatic too,it seems that no one tossed it away as the work of the devil,dots lining up and all,that sort of thinking would come later. Starpath friend and author Leif Karlsen had proven this use of sunstones long ago and published it in his 2003 book Secrets of the Viking Navigators (starpath publications), and the appendix of this book reported the discovery of the Channel Island crystal and for the first time speculated that this was indeed a sunstone used for navigation. The book is presented as a fictional narrative about Viking voyaging with later chapters and appendices devoted to the scientific findings of the author. As noted in the book endorsements, the research was vetted by navigators, scientists, and historians. It is a wonderful book that will be enjoyed by anyone interested in Viking lore... especially those doing research on their navigation! Occasionally, a myth has some truth to it. How do you find out unless it's investigated? Science investigates because it could be an important find, no matter how remote the possibility. Science isn't some magic wand you wave at stuff to find out. For science to work on any given subject you have to be able to devise a test (testability). Also the subject must not be so vague as to be all-inclusive (e.g. 'god') so that you can have the other prerequisite: falsifiability. So I ask you again: What types of tests do you propose? If they're valid/rigorous tests I'm sure you're more than welcome to conduct them and publish the results in a peer reviewed journal. i'm sure that one day Knut did not just pick up a rock and said "check this out,lets put it in a boat and go". It might have been just that simple. Knut might have picked an object and went: "Oh. Shiny." and taken it home or put it on a chain as a talisman. Occasionally observing it on a cloudy day he might have noticed that the appearance of the light through the object changed depending on the position of the sun. Being a viking he either was seagoing himself or knew people who were - and probably knew by experience or tales that navigation on cloudy days was a real problem. Putting one and one together might not have been that hard. Some discoveries are just the product of happy circumstances and an inquisitive mind. So I ask you again: What types of tests do you propose? It depends on the nature of alleged myth. For example, the validation of cold fusion would require the different criterions, then for example the validation of so-called Noah's flood myth. Nice, I had heard of the Sunstones but never knew how they were supposed to work. Knut was one cool dude. I am aware of those discussions and belong firmly in the camp that thinks this word is an "abomination" (a comment borrowed from the M-Webster site). That's why I latched onto that word in the first place. @Voleure, "Irregardless" is NOT A WORD IN THE ENGLISH LANGUAGE!!! ...a lot of complex connections,trial and error and real life testing must have gone into this.very pragmatic too,it seems that no one tossed it away as the work of the devil,dots lining up and all,that sort of thinking would come later. It makes me wonder what life might have been like for a Viking nurd. lol Eric I did mention Oxford. There are many words in the dictionary which are frowned upon at one time or another... language is fluid. Sometimes though an archaic word is the right choice. I have a piece of this stuff and the first time I set it on a surface that had writing and images I was amazed at how well it "magically" brought colors and images to the surface from what it was laid on. Polarisation mate. It works wonders.